Ok, ok I promise this is the last thing I need to say about tortoise shell. If you want the look and don't want to drop $100 plus, just grab a chic hair accessory. (And while they are not available online, you can always try heading to your local mall. *What I'm really saying is: J.Crew has a huge selection in house*). I always buy the tortoise shell barrettes at J Crew. Love the head band with the horse bit. 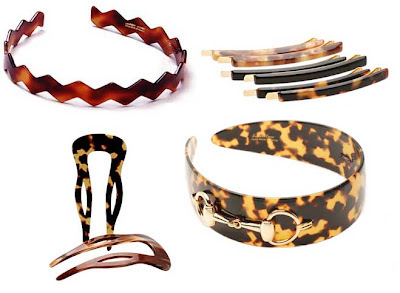 I love tortoise shell too and recently found Lorren Bell's jewelry. I got a great tortoise bangle and he also makes awesome hair accessories too. Glad to find your blog! Coles: Agreed. I so want that headband.